Sponge is representative of the new brand of post-grunge rock currently pouring out of Seattle. Their second album, Wax Ecstatic, on Columbia gave us a motherlode of great new songs and riffs, and the current single, Have You Seen Mary, is a perfect example of what all the shouting is about. Guitar 1 is tuned down one half step. Guitar 2 is in open G tuning, down one half step. Begin by tuning all the strings down one half step. Next, tune your sixth and first strings down a whole step to D-flat. The fifth string is also tuned down a whole step to G-flat. The main riff, Rhy. Fig. 1, is a jangly, Southern Rock-inspired figure that runs through both the intro and choruses and behind the solos. This is a chord pattern that harnesses the guitar’s inherent ability to produce unique droning sonorities. Notice the common shapes in the 10th and 8th positions along with the open first and fourth strings used in the figure [Fig. 1]. These two factors give the riff its particular drone quality. The unusual Gmaj7 to G6 part of the progression also employs common shapes [Fig. 2]. These are in the 1st position and add an F# (for the major 7th) and an open E (for the 6th) to a typical guitar voicing (G/B) for an atypical result. Rhy. Fig. 2, found in the verses, presents an ingenious solution to the problem of how to avoid monotony in an arrangement. Here color is added to a standard barre chord simply by allowing the open first and second strings to sound with the majority of the chord on the remaining four strings [Fig. 3]. Thus, the A barre chord at the 5th fret is made into a more interesting Aadd9 by adding the open В string (the 9th) into the voicing. The open first string further supports the chord with additional open-string texture. This technique is also a favorite of Alex Lifeson of Rush and countless other color-oriented guitarists. Gtr. 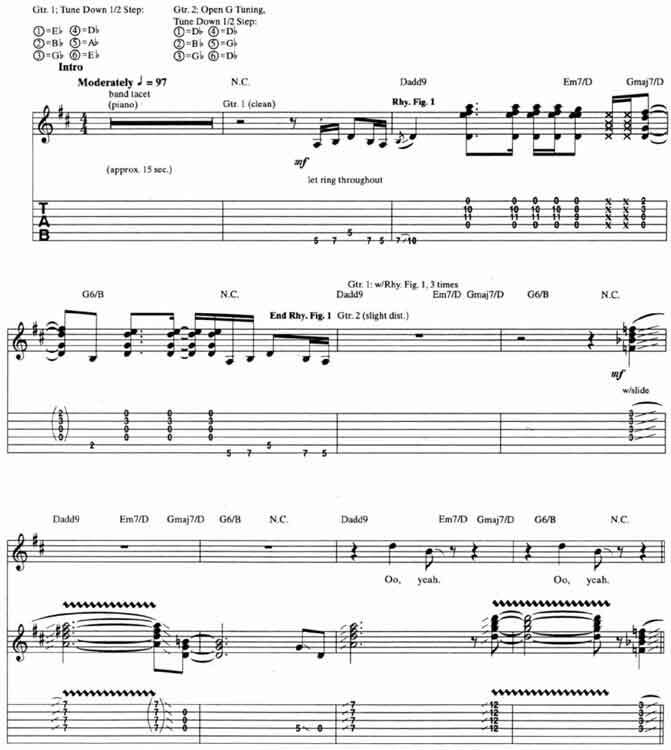 2, in open G tuning, assumes the atmospheric slide-guitar voice in the song. The open tuning facilitates the creation of chord-based melodies, which are a staple of the slide guitar sound. By lowering the first, fifth, and sixth strings a whole step, a major chord can be played as a barre across the strings. This is used to good advantage in both solos as well as in the intro, verses, and choruses. Note that the slurred chords and most of the melodies throughout the song are found as barred shapes on the upper four strings. When playing slide guitar in the tune, position the slide as a barre directly over the frets, not between them as in normal fretting [Fig. 4]. Also remember the basics of slide guitar technique: use your fret-hand fingers to mute out extraneous noises from idle strings, and check the intonation fre­quently as you slide around the fretboard. It’s a part of Sponge Have You Seen Mary guitar lesson. © 2012 - 2019 TabsClub Powered by TabsClub 42 queries in 0.437 seconds.